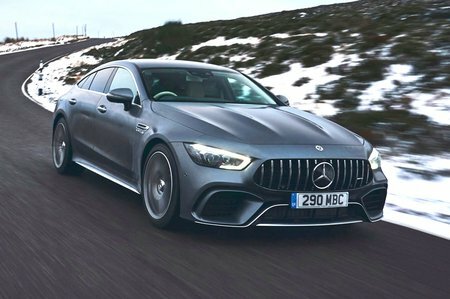 Mercedes-AMG GT 4-door Performance, Engine, Ride, Handling | What Car? The GT 4-door could be considered the new top dog of the Mercedes-AMG range for its price, its size and its presence. It does more than that, though, going above and beyond what the GT sports car offers in one more very important way: sheer power. 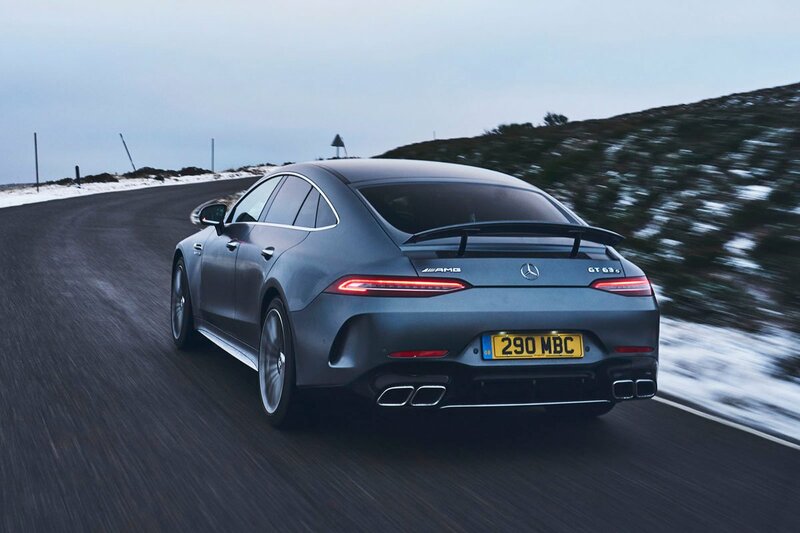 AMG’s well-proven twin-turbo 4.0-litre V8 has been tweaked to produce 630bhp for the top-level GT 63 S derivative of the car, backed up by 664lb ft of torque. 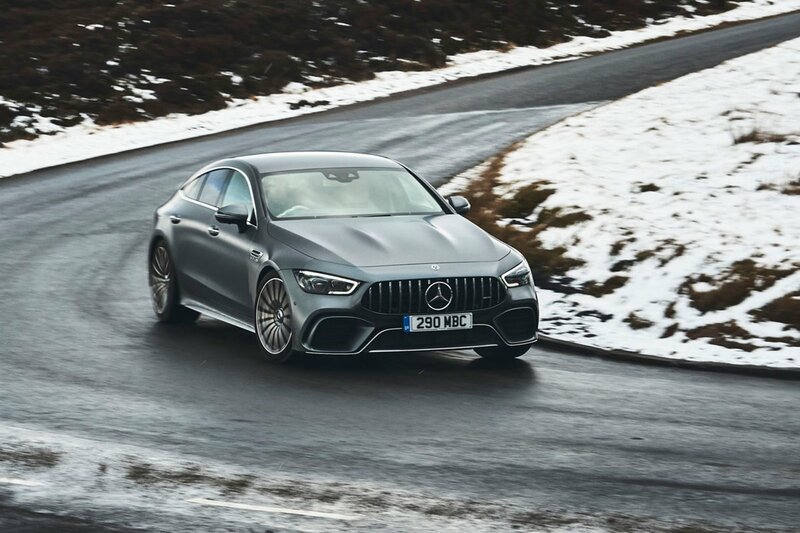 Few would be surprised if the result was anything less than rapid, but the way the GT 63 S delivers its power is like few other cars on the road. Weighing more than two tonnes, this five-metre long monster is bigger and heavier than many luxury saloons, yet is easily as fast as many six-figure supercars. It gets going with very little effort, too, pulling strongly from even low revs and disguising its hefty mass very convincingly indeed. But it isn’t all about prodigious low-end shove; this is an engine that loves to be revved and produces a delicious roar, especially if you’ve got the sports exhaust set to its most antisocial mode. Even pressing the start button is an event in itself. We also got chance to slip behind the wheel of the entry-level non-S GT 63. It might make do with ‘just’ 577bhp, but it still feels crushingly rapid on the road and sounds just as mighty. Unless your name is Chuck Yeager, you’ll probably find it more than fast enough. So, the 4-door lives up to the 2-door GT’s reputation for ferocious performance, but can it deliver the comfort and useability luxury saloon buyers want? Well, yes. It’s a marked departure from the AMG’s usual ‘feisty and firm’ approach, and is softer riding, more laid back and secure in its handling – while bringing much of the refinement enjoyed by drivers of Mercedes’ acclaimed S-Class limo. Apart from the faintest bit of jostling from the suspension at town speeds, the air suspension can massage away the miles quite smoothly. Up your speed and it comfortably deals with rippled road surfaces whilst keeping its body tightly in check; no mean feat considering how porky it is. Thanks in part to standard four-wheel drive, the handling never feels overly sensitive or nervous like the two-door GT’s occasionally can. Don’t think for a second that it’s ever dull, though. Four-wheel steering helps you tuck the nose into bends and there’s enough power sent to the back axle to drive the GT out of corners with a delightfully neutral balance. It’s remarkably forgiving if you have fists and feet of ham, quickly sending power to the front wheels to regain composure if things begin to get out of shape. The S, though, is even better, thanks to a trick electronic differential at the back. It seems to dig in much harder and much earlier into corners, giving you even more traction and – should you be inclined towards a bit of powersliding mischief – the option to select Drift Mode to make it rear-wheel drive only. There are few easier ways to incinerate a few hundred pounds worth of Michelin’s finest. The news gets even better thanks to steering that offers reassuring weight and decent feedback regardless of whether you’re driving the regular or S model. It really helps you place the car on the road and helps it shrink around you in a way a Porsche Panamera never quite does. Switch the drive mode selector from Comfort to Sport, Sport+ or even Race (in the S) and you’ll witness the GT’s body control improving from good to simply astounding for one so big. It’s not as if it brings a massive penalty in ride comfort, either. You can comfortably leave it in Sport mode all day long and even Sport+ is just about acceptable on pockmarked asphalt. It doesn't embarrass itself on track, either. It’s these qualities that really cement the GT 4-door as a true, red-blooded AMG.